Over a period of six months, Russia has purchased 54 tons of gold and has now outstripped China in total gold reserves. Analysts see this as a sign the Russian economy is reducing its dependence on the dollar and the euro, which make up the lion's share of the country's gold and forex reserves. Yet gold still accounts for just 10 percent of Russia's reserves. Russia has become the sixth-largest country in the world in terms of its gold reserves: According to a World Gold Council study, they now amount to 1094.7 tons. This means Russia has overtaken China, whose gold reserves remained at the last quarter figure of 1054.1 tons. "The reasons why the Bank of Russia is increasing gold reserves are obvious: The regulator is reducing the risks over possible sanctions and is diversifying its investment," says Pavel Simonenko, head of CIS sales at Dukascopy Bank SA. According to him, the danger of possible sanctions affecting forex operations in dollars and euros will force the Russian Central Bank to further diversify its assets, so that by the end of the year gold may make up 15 percent of total reserves. "The Central Bank wants to secure its reserves against a possible deterioration of the political situation. Besides, gold is a safeguard asset and, given increasingly more valid reasons to expect a second wave of the global crisis, investment in this type of instrument appears more than relevant," the expert adds. 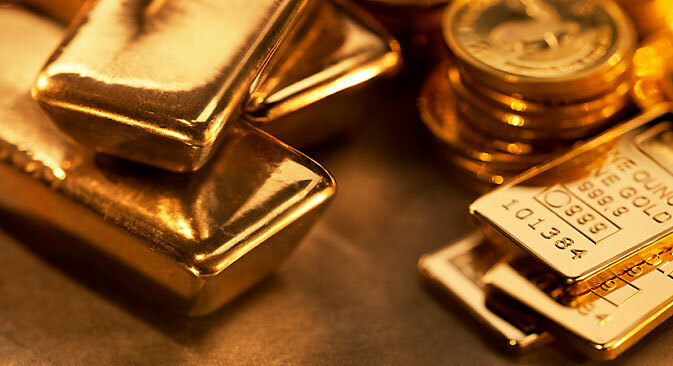 According to the World Gold Council, over a period of six months, Russia increased its gold reserves by 54 tons, a higher increase than any other country. By way of comparison, in the same period of time, Kazakhstan bought 12 tons; Mexico, 0.8 tons; the Philippines, 0.2 tons. Meanwhile, the world's gold-reserve leaders – the U.S., Germany, Italy, France, and Spain – did not buy any gold at all, and Germany actually sold 2.9 tons. As a result, according to official figures released by the Russian Central Bank, the share of foreign currencies in the country's reserves over the same period fell from 90 to 87.5 percent. "We believe that the increase in Russia's gold reserves has to do with a revision of the country's gold and forex reserves. Russia is reducing its investment in U.S. bonds, dollars and euros," says Alexei Kozlov, chief analyst with UFS IC. Furthermore, Kozlov adds, since the European Central Bank and the U.S. Federal Reserve System are pursuing a supersoft monetary policy, i.e. reducing the value of their currencies, while geopolitical risks remain high, it is logical that the share of gold in reserves is rising. Overall, experts agree, the global trend for an increase in gold reserves has become stronger in recent years. "It has to do with a high volatility on the currency markets and the liberal monetary policy dominating in the leading currency-issuing countries," says Dmitry Bedenkov, head of research at the Russ-Invest investment company. According to him, in developing countries that are largely focused on exports, gold and forex reserves are mostly made up of currency reserves. In China, for instance, gold accounts for just 1 percent of the country's reserves; in India, 7 percent; in Russia, 10 percent; in Saudi Arabia, 2 percent; in Brazil, under 1 percent. "At the other end of the spectrum, there are countries where gold makes up a large or dominating share of reserves. For example, in the U.S. the figure is 72 percent; in Germany, 68 percent; in France, 65 percent," Bedenkov explains. That is why, he adds, the increase in gold reserves is a positive trend from the point of view of diversifying the structure of reserves and improving their reliability. In addition to a growing share of gold in the structure of developing countries' reserves, experts note that the Russian economy is making an overall shift away from the dollar and towards other assets. "The process of giving up the U.S. currency is gradually picking up pace in Russia. This is evident both from political decisions and from the actions of the major economic players," says Finam analyst Anton Soroko. For instance, he continues, the Russian mobile phone operator Megafon and the world's biggest producer of nickel, Norilsk Nickel, have already converted their current assets into the Hong Kong dollar. "This process will continue and the next thing that the Russian regulator may decide to do will be to gradually shed U.S. treasury bonds and reallocate the resulting funds outside the jurisdiction of European countries," the expert suggests. However, he adds, this step will be logical only if the current crisis in Ukraine continues to grow and Russia's relations with the European Union and the U.S. fail to improve.